I’ve been loving Application Insights ever since I hooked it up to my Podcast Site. 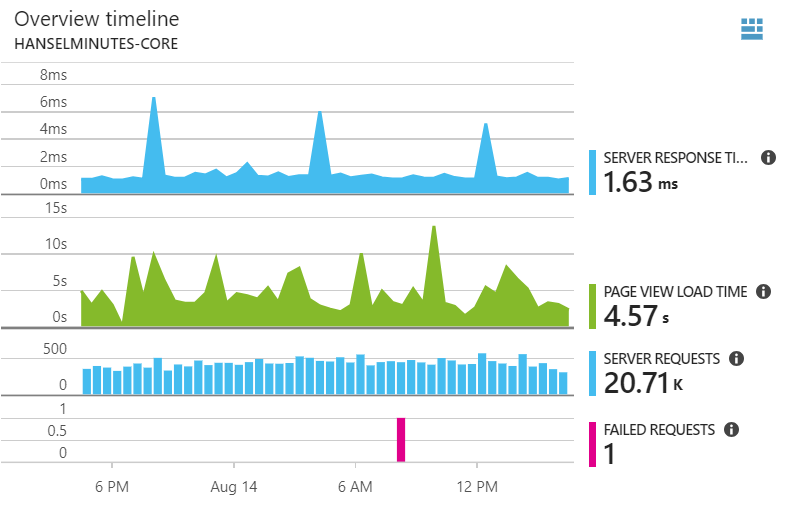 Application Insights is stupid cheap and provides an unreal number of insights into what’s going on in your site. I hooked it up and now I have a nice dashboard showing what’s up. It’s pretty healthy. Here’s an interesting view that shows the Availability Test that’s checking my site as well as outbound calls (there isn’t a lot as I cache aggressively) to SimpleCast where I host my shows. Availability is important, of course, so I set up some tests from a number of locations. I don’t want the site to be down in Brazil but up in France, for example. However, I got an email a week ago that said my site had a sudden rise in failures. Here’s the thing, though. When I set up a web test I naively thought I was setting up a “ping.” You know, a knock on the door. I figured if the WHOLE SITE was down, they’d tell me. Here’s my availability for today, along with timing from a bunch of locations world wide. Check out this email. The site is fine; that is, the primary requests didn’t fail. But dependent request did fail! 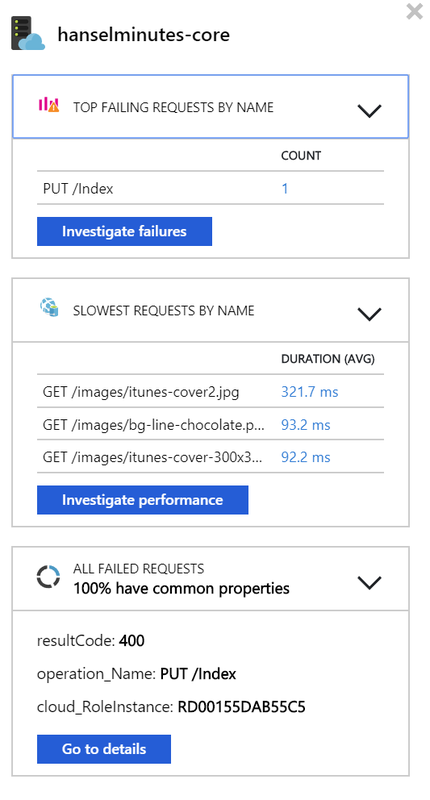 Application Insights noticed that an image referenced on the home page was suddenly a 404! Why suddenly? Because I put the wrong date and time for an episode and it auto-published before I had the guest’s headshot! I wouldn’t have noticed this missing image until a user emailed me, so I was impressed that Application Insights gave me the heads up. Here is the chart for that afternoon when I published a bad show. Note that the site is technically up (it was) but a dependent request (a request after the main GET) failed. This is a client side failure, right? An image didn’t load and it notified me. Cool. I can (and do) also instrument the back end code. Here you can see someone keeps sending me a PUT request, perhaps trying to poke at my site. By the way, random PUT person has been doing this for months. I can also see slowest requests and dig as deep as I want. In fact I did a whole video on digging into Azure Application Insights that’s up on YouTube. I’ve been using Application Insights for maybe a year or two now. Its depth continues to astound me. I KNOW I’m not using it to its fullest and I love that I’m still surprised by it.